From An Phoblacht… many thanks to the person who forwarded this. Posted by guestposter in Irish Politics, Republican Socialism, Republicanism, Socialism. Many thanks to the person who sent this. With luck there will be further reports and photographs tomorrow. ’40 years to the day after his murder by British Paratroops, Official IRA volunteer Joe McCann was commemorated in Belfast. 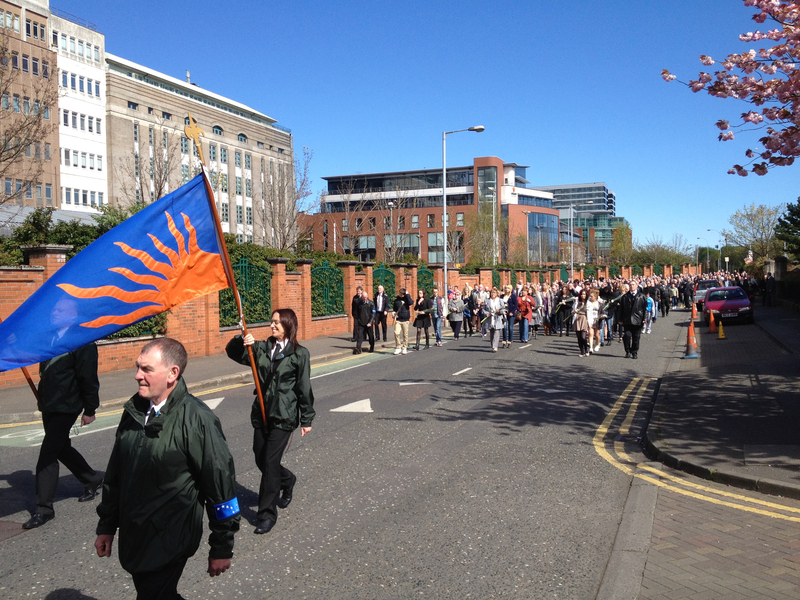 Hundreds of people attended a ceremony in Joy Street (where he was shot) organised by the McCann family. Members of the Official Republican Movement, the Workers Party, the Irish Republican Socialist Party and Sinn Féin (including Gerry Adams TD) were present. 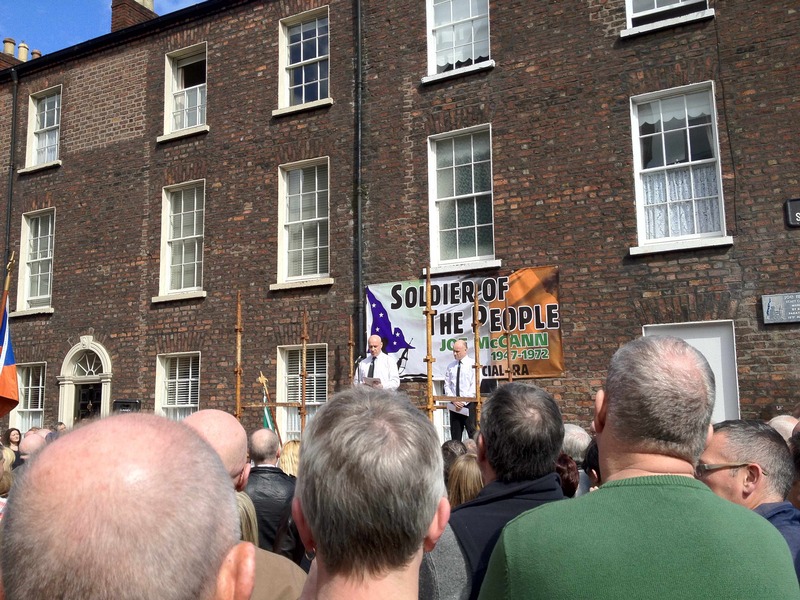 Many of those attending were veterans of the pre-split IRA, the Official IRA, the INLA and the Provisionals. Ciaran McCann chaired the event while his brother Fearghal gave the main oration. Aine McCann read a poem in memory of her father while her sister Fionnuala sang a song about Joe originally written by Market’s woman Margaret Power. Joe’s widow Anne laid a wreath as did members of the extended family. In his oration Fearghal read from a contemporary account of how Long Kesh internee Gerry Campbell reacted to news of Joe’s death. He then placed Joe’s murder in the context of the shootings by British forces of civilians in Ballymurphy and Derry. Fearghal recounted how Joe had become involved in republicanism as a teenager, collecting for internees during the Border Campaign. After firstly joining the Fianna he became an IRA volunteer in 1964. He was jailed in Crumlin Road during 1965 and on release became active again in the various republican political movements of the period. McCann was involved with the Belfast Housing Action Committee and took part in the first civil rights march from Coalisland to Dungannon in 1968. He embraced the idea of an ‘Army of the People’ and the need for the IRA to become involved in social struggles. In August 1969 he was active with the IRA in defence of the people in Belfast: was was arrested again shortly afterwards. McCann took part in the fighting during the Falls Curfew in July 1970 and in August 1971, as commander of the Official IRA in the Markets area defended the district from much larger forces of British troops. The RUC Special Branch and British Army made it clear that they would not take Joe alive and in April 1972 they murdered him. Posted by WorldbyStorm in Northern Ireland, The Left. ‘Fake news’ – Is it news? Do we really need another new party on the Left? Thanks to the friend of the CLR who sent this link from the NewsLetter. A former DUP firebrand Assemblyman and Free Presbyterian minister has told how he wept when he heard that an IRA man had been shot dead by a paratrooper. Writing in today’s News Letter, the Rev Ivan Foster recounts how when he was jailed with Ian Paisley half a century ago he struck up an unlikely relationship with Official IRA man Joe McCann. The Bothy Band 1975 opens with a bouzouki chord aggressively strummed for 3 bars. The chanter on set of uilleann pipes opens a drone from the fourth bar before picking up the tune on the sixth, at perhaps twice the speed it’s usually played. The tune’s then picked up in counterpoint on the bouzouki with a fiddle slightly higher in the mix. This is the Kesh Jig like you never heard it before. By the time the band hits the second tune in the set, Give Us a Drink of Water, all six cylinders are on fire. And then it stops, the Flower of the Flock is picked up on the flute and chanter on the next beat and the band cracks straight into the Famous Ballymote. And that’s just Track 1. The impact the Bothies had on Irish traditional music is evident at any session you’ll go to today. The sets put together on their three studio albums for Mulligan Records are still played in the same sequences and have become part of the canon. It’s difficult though to appreciate how this music was fundamentally different from that which had passed before. Although tune sequencing and arrangements had been messed around with by Sean Ó Riada’s chamber-trad Ceoltóirí Chualann (later to become the Chieftains), and indeed Planxty a few years later, traditional dance music as played by the céilí bands was played strictly for dancing. Percussion was usually provided by a slightly out of tune piano vamping harmlessly away in the background. The tunes were played by all the musicians together with no variation at a leaden tempo. Soloing on the tune was frowned upon. A recent interview in Rabble with Belfast flautist Harry Bradley recalls how ‘Gaelier-than-thou theocrats fucked up trad’. The Public Dance Halls Act of 1935 brought an end to the enduring practice of house and crossroads dances that had been a socio-cultural staple of rural communities up and down the country, although ironically the legislation was intended to protect Gaelic culture from insidious foreign influences. The Act gave rise to the more formal, officially-sanctioned céilí dances in parish halls, events which could be overseen and controlled by the priests. According to Bradley, the pre-Dance Hall Act music was vibrant and highly developed, with distinct regional variations heard on archive recordings by musicians forced to emigrate to the States in the ‘20s and ‘30s. This music was virtually extinguished in later years by the hegemonic Comhaltas Ceoltóirí Éireann, which fostered a competition standard on a younger generation of musicians. Bradly sees it as no accident that Travellers produced some of the most remarkable music of the last century. Having the freedom to be able to avoid assimilation into stifled, formulaic mainstream cultural-nationalist movements, they were able to retain their distinct creative autonomy. The Bothies transmitted something of the wildness of the old music, anchored on the work undertaken by the late Mícheál Ó Domhnaill for the Folklore Commission, collecting songs and tunes in places like west Donegal where the tradition had remained alive. Before the Bothies, he’d cut the Scara Brae album for Gael Linn with his sisters Tríona and Maighread and guitarist Dáithí Sproule, an lp which somewhat lacks the bite of his later recordings. A while later he began performing with Mick Hanly in a duo called Monroe. In 1974 they released Celtic Folkweave, which featured four future members of the Bothy Band. And this is where it really started. The Bothies formed as a seven piece, Seachtar, founded by bouzouki player Dónal Lunny, who’d left Planxty to set up Mulligan Records. One version of the story has Lunny inviting piper Paddy Keenan, flute player Matt Molloy, fiddler Paddy Glackin, and box player Tony MacMahon to get involved in an early project for the new label. They were subsequently joined by Ó Domhnaill on acoustic guitar and Tríona on clavinet and vocals. Another has the group minus Lunny playing sessions in Dublin pubs before being asked by Lunny to record a few tracks. The name change came after MacMahon left to work as a producer for BBC, the Bothy Band being a nod to the migrant workers of Donegal and Mayo who’d work the Scottish potato harvests, living in deplorable conditions, but bringing the music over with them. The first lp was recorded with Tommy Peoples on the fiddle. Peoples had replaced Glackin and both brought something of the Donegal tradition to their playing, a fast, highly ornamentative attack, frowned upon by the Comhaltas cultural fascists as being derivative of Scottish fiddling. Keenan came from the Traveller tradition of piping, his flowing, open-fingered style echoes the great Johnny Doran; although he was 19 or 20 when he first heard a tape of Doran’s playing, his own style was a direct result of his father’s tutelage. Lunny’s description of him as the ‘Jimi Hendrix of the pipes’ might be a bit off the mark, but his playing and especially that with the Bothies’ third fiddler Kevin Burke, brought life back to the pipes as an ensemble instrument where before the volume it produced relegated it to solo performance. Lunny was probably the best-known of the lot of them, having played with saccharine charting folk band Emmet Spiceland before holing up with Christy Moore on the Prosperous lp and putting Planxty together. The bouzouki at this stage had been popularised by Johnny Moynihan and Sweeney’s Men and Lunny brought it to the Bothies as a percussive force, where, with Ní Dhomhnaill’s heavy left hand, they redefined the concept of the rhythm section. Molloy was also from an older tradition. A child prodigy on the flute, he’d moved to Dublin from Mayo in the ‘60s and played in a distinctive style which used a technique similar to that of the travelling pipers. Where his contribution to the first album is equal to the rest of the band, it was his playing with the third Bothy fiddler Kevin Burke from the second lp that marked him out. London-born Burke was steeped in the Sligo tradition, one which was rarely heard around Sligo anymore in but survived in ex-pat communities abroad and especially in the recorded music of Michael Coleman. It’s difficult to talk about The Bothy Band 1975 without referring to the production. Undertaken by Lunny and Ó Domhnaill, whichever way the studio microphones were placed managed to capture the subtleties inherent in a music produced by a variety of instruments, all with different characteristics and volumes. Nothing was lost in the mix. The clips below show that none of the Bothies were foot-tappers, yet on vinyl at any rate a foot can be heard faintly over the few quieter moments in the sets. At one point you can even hear Lunny smile. The album rescued tunes from the north Connacht and Donegal traditions that while ubiquitous today, were rarely heard on the wireless and were well beyond the repertoires of the céilí bands. There was an obvious analogy with punk rock (picked up on in the Bradley interview), a musical snook at the ‘new’ traditionalists with a deep respect for the old. Where it certainly wasn’t dance music, you couldn’t fault the musicianship. What’s interesting today though is the audience reaction on the televised clips linked below which mostly date to the period just before the band broke up in ‘79. There’s seemingly little joy to behold in the room behind the smug of cigarette smoke, although Kevin Burke’s comedy turns would usually raise a laugh. Apart from Burke’s party pieces, the songs were sung by the Ó Domhnaills, mining a seam of Donegal songs collected by Mícheál from his Gweedore relatives and their neighbours. As the Sweeneys had done before them these were songs well outside the come all ye bar room republican tradition. Pretty Peg sung by Tríona runs effortlessly into Craig’s Pipes, a tune common to both Irish and Scottish traditions though played to different rhythms. This is followed on the lp by a strathspey and reel, Hector the Hero and The Laird of Drumblaire. The Scottish influence in their tunes waned somewhat with the departure of Tommy Peoples but remained in the band’s name. Grounded on Ní Dhomhnaill’s clavinet, the Butterfly if anything demonstrates what can be done with the tradition when the musicians aren’t all beholden to play the same notes at the same time. We’ll come back to the Butterfly later. It’s the sets however that made the lp; the attack was relentless, the tunes took off, as one critic put it, like jet engines. Even if you’ve a deep-seated aversion to anything folky, it’s an lp that might just be a gateway drug into the wider tradition. The Bothies had a reputation for being fond of a few jars and were constantly on the road. A lethargy and world-weariness can be heard to some extent on their third studio lp Out of the Wind – Into the Sun (1977) where the attack was maintained for their second Old Hag You Have Killed Me (1976). This featured their biggest ‘hit’ Fionnghuala, was an exercise in close harmony mouth music collected by Ó Domhnaill in the Hebrides. You’ll hear another slicker version these days advertising something or other on the telescreen. Their final lp After Hours was recorded in front of a Parisian audience and where the songs don’t appear on the studio albums and lag somewhat in a live context, the tunes come alive with even better performances than the versions previously recorded. It’s probably the easiest Bothy Band album to pick up second-hand and many’s the night it’s kept me awake driving across the country from some event or other. The Bothies seem to have simply burned out. Constant touring and frequent refreshment stops on the way took their toll for little financial award. Lunny had been there before with Planxty and it must have been difficult for all of them to stop making such vital music together. Stop they did as a band but they continued to play together in various combinations, pushing the music forward in different ways but never looking back to the speedier days of their younger selves. But here is probably where they influenced the tradition more and a handful of albums to come held on to the Sligo and Donegal traditions, bringing them to places they hadn’t been before. Paddy Glackin continued playing possibly less lubricated sessions after he left the Bothies, but what he recorded in 1980 brought the Donegal fiddle tradition straight into the world of electronica in Hidden Ground, his one-off collaboration with keyboardist and polymath Jolyon Jackson. Jackson has been mentioned here before in connection with Supply Demand and Curve, a Dublin jazz rock combo who swam in the same bohemian waters as Phil Lynott’s Orphanage and Dr. Strangely Strange. Where Glackin brought the fiddle and the tunes (many of which appeared on Bothy Band set lists), Jackson brought a list of instruments too long to list here, but principally an ARP Odyssey and a Polymoog. The former was a portable analogue synthesizer introduced in 1972, one of the first with duophonic capabilities (you could play two notes at the same time) with a sample-and-hold function controllable with sliders and buttons to the front. The Polymoog was a more serious machine altogether, associated more at the time with Gary Numan. Comhaltas have yet to assign a competition category for either device. The first track, The Long Note, was the name of a long-running wireless show hosted at different times by Glackin and Ó Domhnaill. The lp is a divil to find second-hand but their version of The Butterfly can be heard below. If you like what you hear, some useful soul has uploaded the entire album. Tommy Peoples wasn’t idle either. His 1976 lp The High Part of the Road was recorded with Paul Brady playing what can only be described as tasteful guitar, accompanying the Donegal fiddler on the tunes that had been forgotten prior to the Bothies’ intervention. A more ‘traditional’ album than the others mentioned here, it was recorded the same year Brady got together with Andy Irvine to produce their lysergic exploration of the outer boundaries of dub … well no, but you see where I’m coming from. The High Part of the Road hasn’t made it onto YouTube yet, but most of the tracks on the next lp recorded as a trio with Matt Molloy in ’78 are up there. Brady’s guitar predominates and where he picks out the tunes rightly, the guitar is no substitute for Peoples’ fiddle. As an aside, I’ve only seen Paul Brady once; this was in the back room of a pub in Ballyshannon where instead of giving us Arthur MacBride at The Lakes of Pontchartrain, we were treated to a raucous hour of boogie-woogie piano. Respect. Burke and Ó Domhnaill kept going as a duo after the Bothies. The experience must have had a profound effect on the fiddler whose outward appearance underwent a change similar to that forced on Dexy’s Midnight Runners by Kevin Rowland in the run-up to their third lp. Burke cut If The Cap Fits for Mulligan in 1978, an album that featured Lunny, Ó Domhnaill and several others on the Mulligan label. Side 2 is essentially one long breathless set starting with Toss the Feathers and with a modicum of fiddle overdubbing throughout, you can close your eyes and you’re in some auld fellas’ pub in Sligo, with Paul Brady coming in on a céilí band piano as the track fades out. Burke and Ó Domhnaill continued as a duo after the Bothies. Before basing themselves in Portland Oregon for what seemed like a millennia, they cut Promenade for Mulligan in 1979, an album known for the version of Lord Franklin and which should really be better known for Ó Domhnaill’s rendition of Coinleach Ghlas An Fhómhair. If the fans expected a fourth Bothy Band lp they were to be disappointed. This was a more laid back affair, the title track a bossa nova slip jig, the tunes played at a much slower pace as if Burke was still getting his breath back after his time on the road with the Bothies. Personally speaking, things started to go downhill in the ‘80s when the whole scene began tilting towards the New Age. Certain former Bothies were as central to this development as they had been to the transformation of the tradition 10 years earlier. That still upsets me. If you happen to find yourself on the northside of Dublin tomorrow (Sunday 24 January), myself and an archaeological colleague will be selecting this sort of stuff on the wheels of steel in a Smithfield hostelry from 8.00. Put it this way, it’ll be the first time Dice Bar hipsters will hear Christy’s version of Joe McCann. Crowds gathered at the entrance to NUI Galway, along with several protest groups, including members of the Socialist Workers’ Party. Dr Micheline Sheehy Skeffington and students from Femsoc demonstrated over gender equality. One protester carried a placard reading “Joe McCann – murdered by 1 (one) Para 15/4/72” – referring to the killing of IRA volunteer Joe McCann in Belfast in 1972. Prince Charles is commander-in-chief of the British Parachute Regiment. That, of course, was OIRA volunteer, Joe McCann.